I married the love of my life, Elizabeth “Lizo” Medina-Gray, on the end of the world, May 21, 2011. Yes, no less than Mr. Loafy Carl himself, Neal Iannone, came out of his 2004 retirement to give us this comic as a wedding present; that’s how you know the Big Day really was a big deal. Our wedding was held in lovely Brookside Gardens in Wheaton, Maryland, a place which Lizo’s been visiting with her family (and now, me) since she was a little girl; there’s even a plaque in honor of her grandmother down one of the paths. Our videogame integration was a little more ham-fisted than Mike and Vangie’s classy approach. 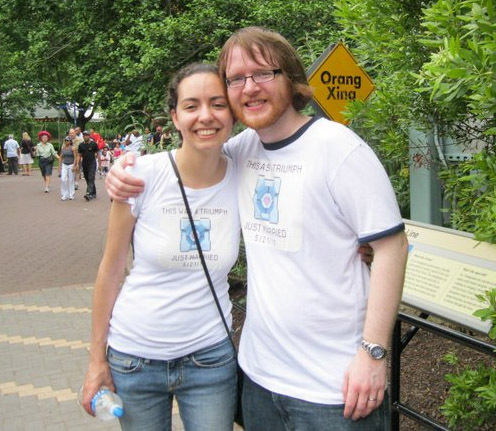 Going into the happiest day of our lives, we basically had two themes: videogames, and plants. The plant integration is pretty obvious (we got married in a garden) and was pretty easy to handle; but we had to get a little more creative to work in our favorite pastime together. We even had a table called—yes, Lizo actually let me get away with this—”Wright and Co. Law Offices.” (She wouldn’t let me name one after the world from BioShock, though. I wonder why…) Appropriately, that’s where we stuck our GameCola guests. Of which there were many! 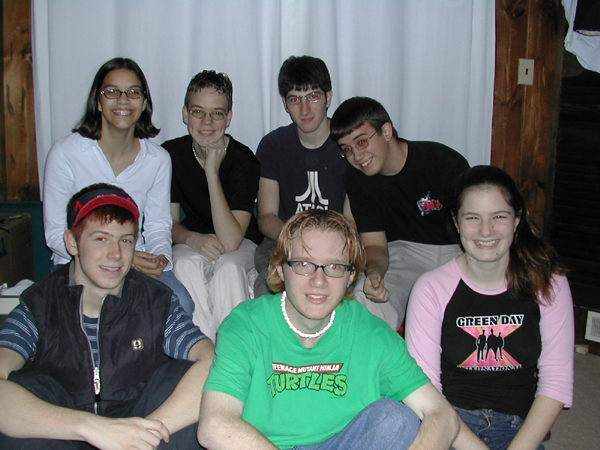 Neal wasn’t the only GameCola staffer (well, former staffer—we still miss you, buddy!) in attendance. Nathaniel Hoover took the train down from Connecticut, Michael Gray flew in all the way from the other side of the entire country, which still blows my mind, and Mike and Vangie themselves drove in from…well, another part of Maryland, but it was at least forty minutes away. And that’s not to mention that my Best Man was Matt Gardner, and his self-appointed Assistant Best Man (and also official groomsman) was “Captain” Eric Regan. Or that my other two groomsmen, my brothers Rick and Dan, have contributed to the site in the past, as well—Rick was even voted as GameCola’s Reader of the Year in 2005. Heck, even the Maid of Honor, Lizo’s little sister Jenny, has appeared in GC before! It was a real GameCola affair. But back to the Big Day. During the introductions to the reception, we had our wedding party come out to an elegant version of Maya’s theme from Phoenix Wright (which some in attendance might have recognized from this edition of The Off-Topic Podcast), while Lizo and I came out to “The Power of Love,” by Huey Lewis and the News. Why “The Power of Love”? Do you really have to ask? The thing I think everyone will remember best about our wedding, though, was the replacement we came up with for a “first dance.” I’m just going to throw it out there: we had a “first videogame,” instead. I’m totally serious: first videogame as husband and wife. Before you get all huffy and sorry for our poor family members who had to sit through us defeating Sepiroth together, though, hear me out. It wasn’t just some random level in some random videogame that had nothing to do with us personally. 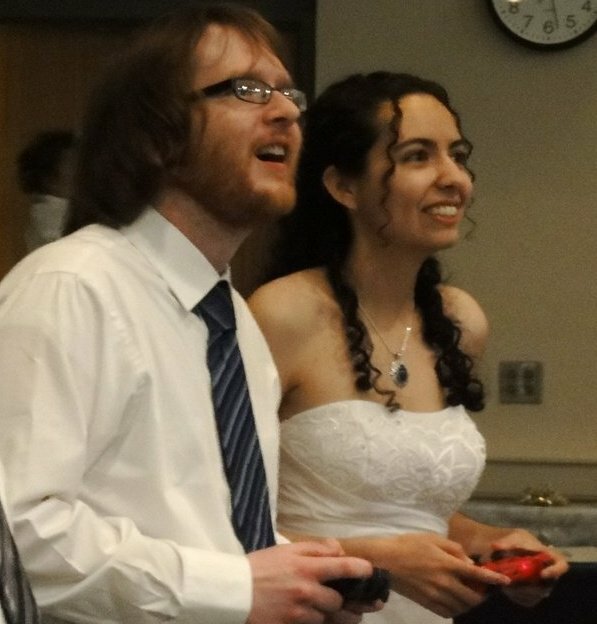 Our Best Man, Matt Gardner, actually created an entire level in LittleBigPlanet 2 specifically for Lizo and I to play on our special day, as our first game together as husband and wife. His gift to us. I’m going to try to get the level up on YouTube later if I can. Actually, wait; I’m sorry. Before I wrap up, there’s one more final, final thing. 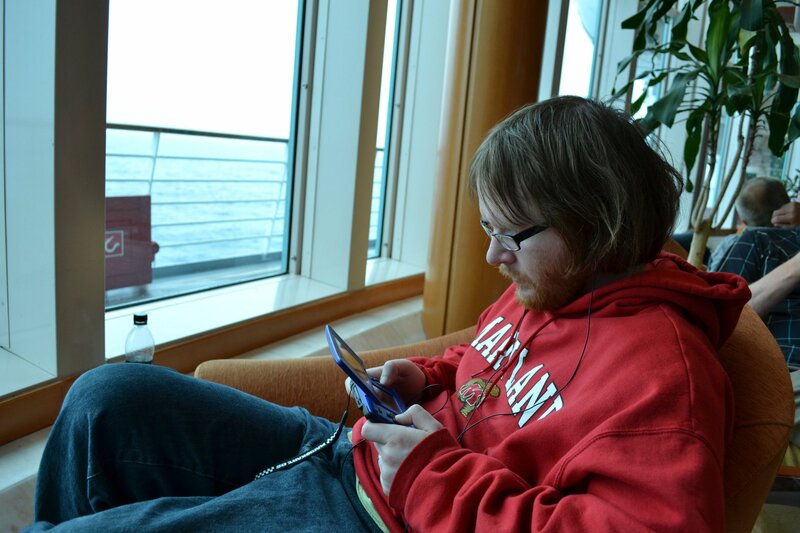 For our honeymoon—a cruise down the fjords of Norway—we made sure to pack the essentials: namely, our Nintendo DS’s. We even each bought a new game just for the occasion. And, the hell of it is…we actually played them. Both of us. I’m glad the world didn’t really end. P.P.S. I’m pretty sure the GameCola table actually podcasted my wedding; hopefully we’ll be able to get that out to you at some point. Congrats Paul and Lizo. A winner is you! The wedding was more fun than a barrel of monkeys. No one ever posted who the people in both photos are! I KNOW THE ANSWER! Is the prize money still available for this? Literally all of the prize money is still available. The answer is: ME, Neal, and Doug! Also possibly Christina. If you had only guessed Gina, I would’ve given it to you! I’m not guessing Gina. I’ll guess “Golden Boy” Brian Vanek and leave it at that. In other news, where is the Youtube video of your wedding level?! I still have to come up with a proper name for the level! UPDATE: Three months later, we’ve finally gotten around to publishing the level to the LittleBigPlanet 2 network! Just search for “Mr. Face Opposes This Marriage” to check it out. It’s the next best thing to marrying me yourself! Next on my archive-diving session: The video made me chuckle. This was sweet to see. Just realizing that “Wow, these events were current at some point” is awe-inspiring. Two questions (since this was long enough ago that “recent posts” isn’t relevant enough anymore): Did the wedding actually get podcasted/posted at some point? Also, has there been any video of “Mr. Face Opposes This Marriage” to the internet? I said two, but here’s a third: this is titled “A Very GameCola Wedding 2”, so is A Very GameCola Wedding 1 just hidden under a different name, or is there a different reasoning as to why “A Very GameCola Wedding” doesn’t yield it as a search result? D’Arvit! Ignore that last point, it was linked to in “Wed Hard with a Vengeance.” But it doesn’t pop up when I type it in the search box, so that point still stands. For the first two questions, I’m pretty sure it’s no to both! I actually have the wedding podcast files…it was just difficult to edit and impossible to tell who was talking, and it’s more entertaining to people invested in it than to people on the site in general. Too bad! Also, for the last one—keep in mind that the search will ignore “A” and give results for posts with the words “very”, “GameCola”, and “Wedding” anywhere in them…I imagine a lot of posts have “very” and “GameCola” somewhere. 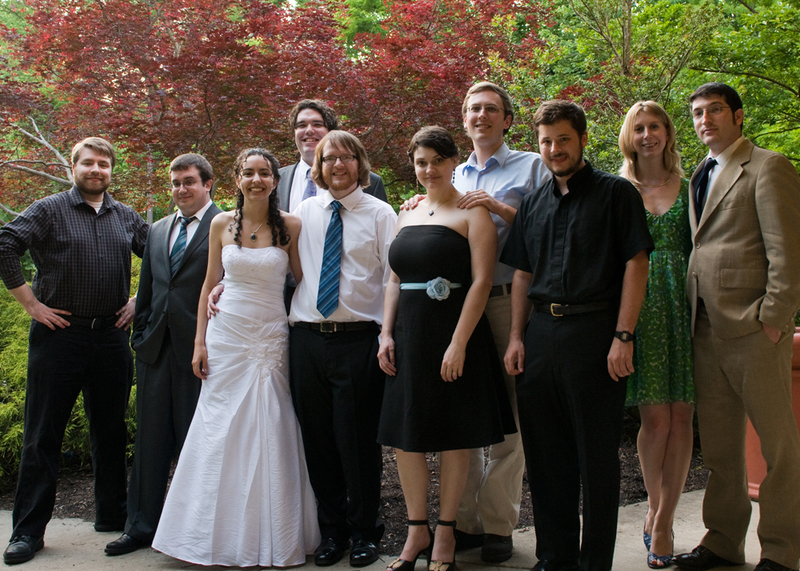 If you click on the “A Very GameCola Wedding” tag up at the top, though, you get all three!